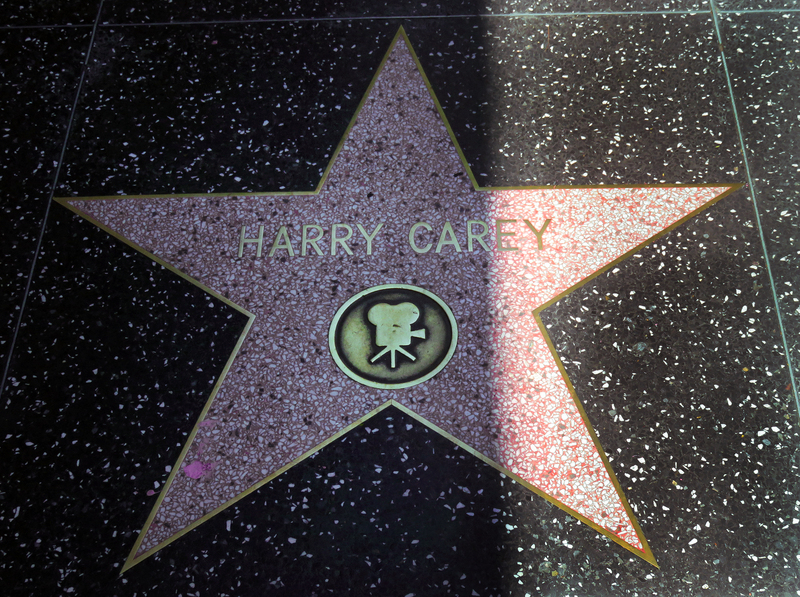 April 26, 2015 — Actor and Saugus rancher Harry Carey's star on the Hollywood Walk of Fame. The star is located on Sunset Boulevard, just up from the northwest corner of Sunset and Vine. Carey was inducted into the Walk of Fame posthumously on Feb. 8, 1960. Actor Harry Carey (Sr.) acquired a homestead at the mouth of San Francisquito Canyon in 1916 and established a rancho. The ranch included the Carey's wooden ranch home as well as several outbuildings and the Harry Carey Trading Post, which was a tourist attraction that included billed entertainment from Navajo Indians and other performers, along with a store that sold Western and Indian curios. The ranch was occasionally used for filming. The Careys' son, Harry Carey Jr. (Dobe), who would follow in his father's acting footsteps, was born in the Carey ranch home in 1921. The trading post washed away in the St. Francis Dam disaster of March 1928 and was not rebuilt. The Indians left about a month earlier. According to Dobe, a shaman saw "a big crack and predicted it would break." The ranch house was situated at a higher elevation and survived the flood, only to burn down in 1932. The Careys replaced it by building a Spanish adobe home, which they sold with the rancho in 1945. Harry Carey was born Henry DeWitt Carey II on January 16, 1878 on 116th Street in the Bronx section of New York City. His father was a special-sessions judge and president of a sewing machine company. Harry attended a military academy but declined an appointment to West Point, instead trying his hand as a playwright. According to the Internet Movie Database: In 1911, his friend Henry B. Walthall introduced him to director D.W. Griffith, for whom Carey was to make many films. Carey married twice [correx: 3 times; see here], the [third] time to actress Olive Fuller Golden (aka Olive Carey), who introduced him to future director John Ford. Carey influenced Universal Studios head Carl Laemmle to use Ford as a director, and a partnership was born that lasted until a rift in the friendship in 1921. 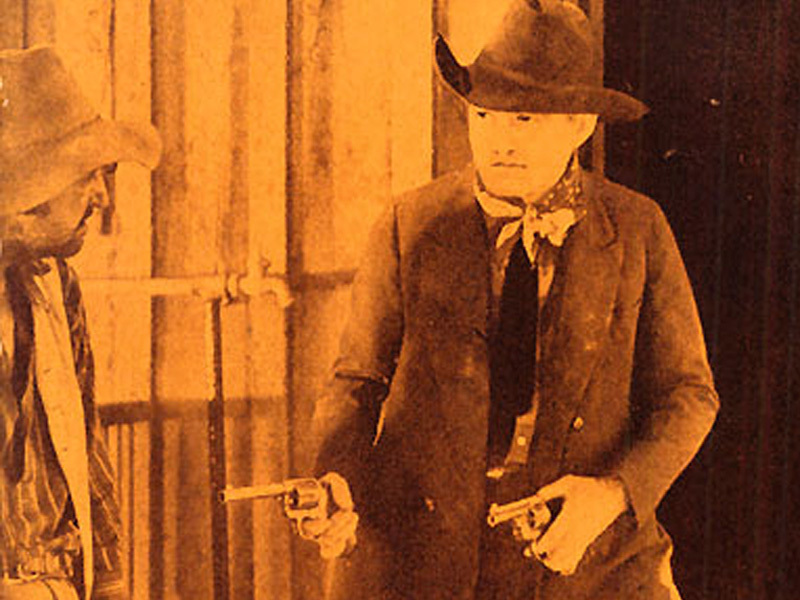 During this time, Carey grew into one of the most popular Western stars of the early motion picture, occasionally writing and directing films as well. In the 1930s he moved slowly into character roles and was nominated for an Oscar for one of them, the president of the Senate in "Mr. Smith Goes to Washington" (1939). He worked once more with Ford, in "The Prisoner of Shark Island" (1936), and appeared once with his son, Harry Carey Jr., in Howard Hawks' "Red River" (1948). He died Sept. 21, 1947, in Brentwood, after a protracted bout with emphysema and cancer. Ford dedicated his remake "3 Godfathers" (1948) "To Harry Carey — Bright Star Of The Early Western Sky." Carey would appear in at least 233 films, including short features, between 1909 and 1949. Further reading: Harry Carey Ranch: Historic American Buildings Survey No. CA-2712. LW2785: 9600 dpi jpeg from digital image by Leon Worden.